As we grow old, we lose facial fat. Also, the facial support structure gets weak. To redefine facial contour and get back youthful appearance thread lift is a safe alternative to traditional facelift cosmetic surgery. It is also referred to as ‘lunch hour lift’. This procedure reduces sagging around jawline, cheeks and neck. It lifts drooping eyebrows and deep nasolabial folds. Instead of dramatic results, thread lift provides subtle and modest changes.The recovery time is very less, the outcome is immediate, and even the cost is reasonable. A thread lift is an aesthetic procedure that treats minor facial and neck sagging to render a rejuvenated appearance. It can be done on mid face, lower face, neck or brow. The treated area is raised and sagging is eliminated. It is a minimally invasive method. The scarring is virtually invisible, and threads are hidden within the skin once they are knotted.Many a times thread lift is done in combination with other non-invasive procedures such as laser treatments, anti-wrinkle injections and facial peel to improve the texture of the skin. Also, liposuction may be done at the same time to enhance the facial contours. There are various types of thread lift techniques. Among them, the most popular ones are Contour thread lift and Aptos thread lift. 1. Contour thread lift- Here the threads are fixed in the area of first access and are unidirectional. Contour thread lift uses unique threads made up of non-absorbable clear polypropylene. The threads are guided along designated contour lines to improve the precision. The incision through which the threads are inserted is made above the hairline, and sagging skin is lifted and tightened. 2. Aptos thread lift- The threads used in Aptos thread lift are made up of single strand non-absorbable material known as polypropylene. Polypropylene has been used for surgical stitches for a long time. The threads are designed by bi-directional barbs going outwards from the mid of the thread and pointing inwards towards the mid so that they can be inserted under the skin and the cogs to hold the lift. 1. Barbed thread or free cogged- Barbed lift suture does not require to be suspended. They are self-supporting sutures just like hold-up stocking. They are the most commonly used threads now-a-days. 2. Suspension threads or smooth threads- Suspension threads need to be suspended to a stable structure of scalp or face. This type is best suited to the patients with mild to moderate facial tissue sagging. It is mostly recommended to the patients in mid-thirties to fifties. Suspension threads may be resorbable or non-resorbable. They are mostly made up of nylon or prolene. To reduce early signs of aging such as sagging skin of face or neck. You cannot afford much time or money to undergo facelift surgery. To improve your look through cosmetic enhancement, avoiding the potential side effects of facelift such as scarring. The effects of previous neck lift and facelift is wearing off. The weakening of muscles causes brow or cheek sagging in younger patients. A thread lift is done in older patients who have undergone a facelift to provide support to the soft tissues elevated in a facelift. Client with minimal aging signs and in need of a minimum lift. Individual in the 30s to 60s with a right skin tone and if your skin is not too lax. Your skin is not prone to keloid or scars. Also, there is no history of poor wound healing. Your doctor will evaluate your health and lab test will be done to ensure that you are fit and healthy for the procedure. Avoid medicine that increases the risk of bleeding from a week before the procedure. Avoid wearing makeup on the day thread lift is to be done. Do not drink or eat anything from the midnight before the surgery. If you fall sick the day before the procedure, consult your doctor. Your surgeon after evaluating your health condition will decide whether to postpone the surgery or not. Stop smoking 14 days before the procedure. Photographs are taken before the surgery to compare with the final results. Thread lift can be performed in an ambulatory setting under local anesthesia. Some surgeons also prefer the administration of light sedatives through an intravenous drip to make you feel drowsy and reduce the discomfort. The whole procedure of thread lift may take half an hour to 2 hours depending on the location, the number of the areas to be treated and on the type of the thread used. In thread lift surgery, particular surgical suture threads are used to hold the repositioned tissue and skin after the surgery. If the smooth thread is used, they are inserted with the help of a standard needle into the skin. The smooth threads are required to be attached to the anchoring points to sustain the lift. It is a more technical method and requires a detailed knowledge of anatomy to provide good anchorage for the lift. If free-floating barbed threads are used, then with the help of spindle needle the fine filaments are inserted under the skin into the subcutaneous fat through the tiny incisions. The incisions made are about 1-2 millimetres in size and are made behind the hairline or the ear. Through the incision, the thread is advanced along the pre-marked key areas on your face. The needle is removed. The barbs on one side of the thread cog to the outer skin and is lifted. The barbs on the other side attach to the tissue beneath the skin to secure the desired position. The excess of the thread is trimmed, and ends of the thread are buried under the skin to give the scar-free result. The number of areas to be treated decides the number of threads. In general, 18 open threads are used for a full face thread lift that includes two filaments for each brow, 2 for each jawline, 2 for each neck side and 3 for each cheek. 1. Closed technique- Here the soft tissue is moulded over the sutures in different location points until the appropriate location is caught. 2. Open technique- Surgeon uses an instrument to create a raw surface under the skin. Here, when the sutures are pulled up, the lift remains at the appropriate position. 3. Combination technique- This technique involves the use of sutures at multiple tissue level so that all the barbs are caught. The suspension created here cannot be created with non-barbed sutures. The number of threads ranges from 2-20. The results of thread lift is immediate. There may be swelling, bruising or discomfort after the surgery that subsides in a few days. There may be tightness or difficulty in mouth opening for 1-2 days. 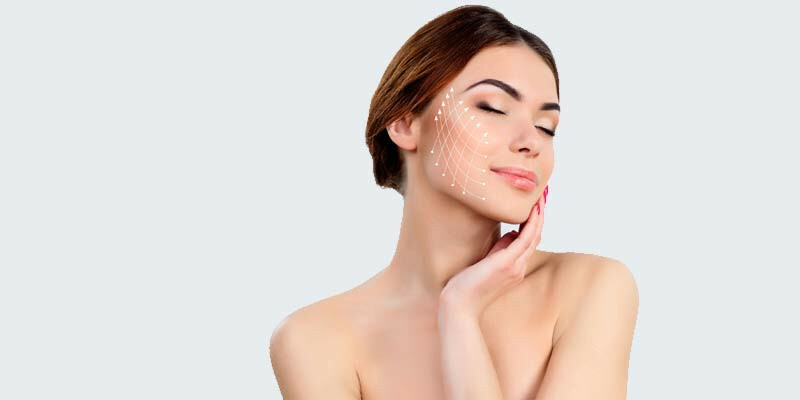 In a thread lift surgery in comparison to a traditional facelift, the postoperative bruising and swelling is reduced because here the tissues are not separated, and also the lifting of skin is less. Your doctor may prescribe pain medicines to ease discomfort. The result lasts up to three years, and then there may need to tighten or add more threads. There is no or minimal downtime. This method mostly benefits young people with early signs of aging. Old people with lots of sagging skin may not get optimum results. Thread lift involves minimal discomfort, and there is no visible scarring. After the surgery, the skin looks younger, tighter and toned. The recovery period is not more than a week. Eat whatever you desire but if you feel nauseated drink only small amounts of clear fluid. Eat soft foods for a week to 10 days that do not require much chewing. Better avoid makeup for 2-3 days. Do not rub your face during the recovery period. Avoid exertion and lifting heavy weight for at least two weeks. While sleeping keep your head elevated with the help of pillows. Do not wash or touch your face for 12 hours post surgery. Avoid chewing gum for two weeks. Apply ice for 10-20 minutes 4 times in a day for 4-5 days. Keep the incision clean. Follow the instructions given by your surgeon on cleaning incisions. 1. Which surgeon to chose for a thread lift? To ensure proper results, it is essential to select an experienced surgeon. Consult Dr. Parag Telang. He is Mumbai’s most preferred board-certified cosmetic surgeon. 2. Does insurance cover the cost of thread lift? No thread lift is an aesthetic procedure; insurance doesn’t cover its cost. 3. How many days after having thread lift can I return to work? You can return to work the very next day after thread lift if you are comfortable in wearing flesh colored thin bandages. 4. What are the risks associated with thread lift cosmetic surgery? Thread lift surgery carries minor potential risks such as infection, swelling, bruising, numbness and tenderness. Mostly these changes are temporary. Also, thread lift holds the slight risk of seroma or haematoma, asymmetry, dislodging of thread or chances of recorrection. * Will thread lift change my facial features? In thread lift, the soft tissues are repositioned to the original position with the help of threads.Thus, unlike a facelift, it rejuvenates your face without bringing any changes to your natural facial features. 5. What is the cost of thread lift? The cost of thread lift is decidedly less than a traditional facelift and depends on your location, surgeon’s skill and type of the thread used.